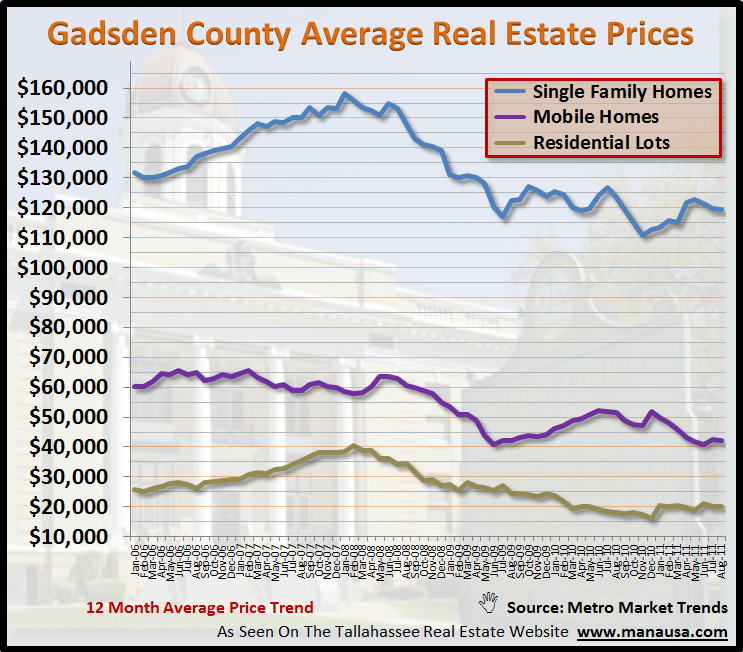 Average real estate prices in Gadsden County, Florida had been dropping for quite some time, but recent trends over the past two years show that the average single family home price in Gadsden County is bouncing up and down around the $120,000 price range. Remember, average prices and average values are two separate measurements, but over time, they tend to move in the same direction. Average single family home prices in Gadsden County once peaked at $160,000, but have declined to nearly $120,000 last month. They are shown in blue in the real estate graph below. You can see all the homes for sale in Gadsden County by using the map based property search tool on our website. There have been no condo and townhouse sales, but land and mobile homes appear to be stabilizing over the past few months. You can find volumes of market reports for Leon County and Tallahassee here and on the Tallahassee Real Estate Blog, or you can have the Tallahassee Home Sales Reports emailed to your inbox when they are published.